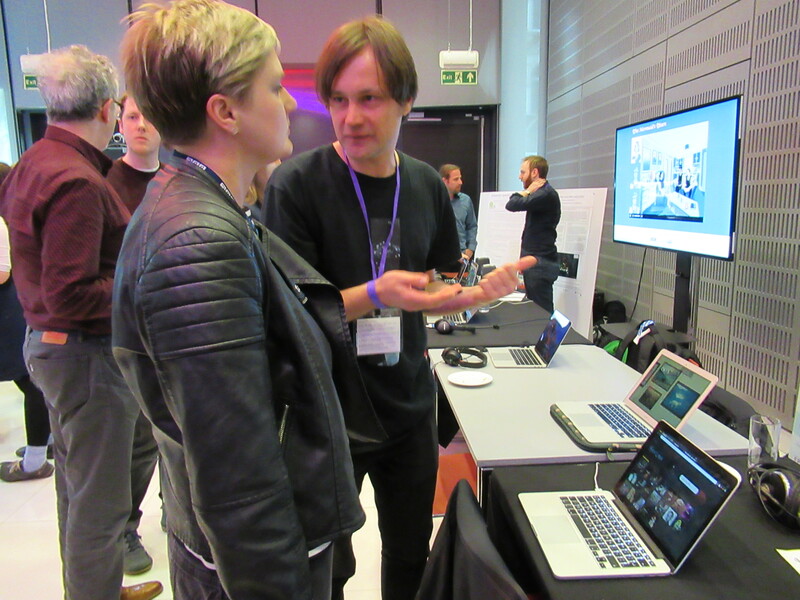 On Wednesday 2 May, FAST team members from the Centre for Digital Music at Queen Mary, Alo Allik and Josh Reiss, presented their latest research at the Sounds Amazing 2018 event at the BBC in London. 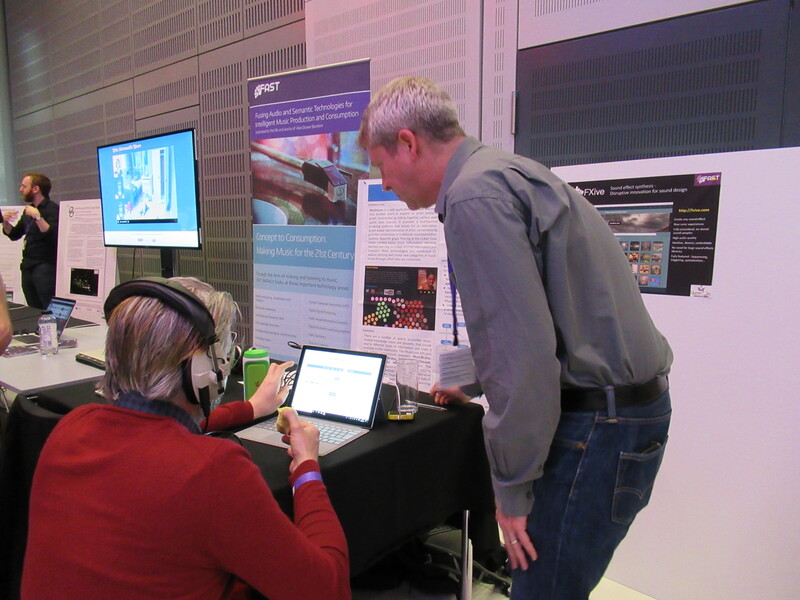 The event was attended by researchers and professionals working in the field of spatial audio. Alo Allik gave a demonstration of MusicLynx, a web application for music discovery that enables users to explore an artist similarity graph constructed by linking together various open public data sources. 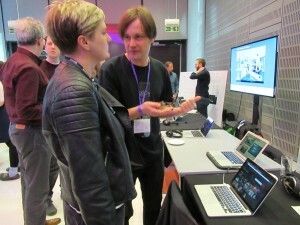 Josh Reiss gave a demonstration of FXive, a new way to perform sound design. High quality, artistic sound effects can be achieved by the use of lightweight and versatile sound synthesis models. Such models do not rely on stored samples, and provide a rich range of sounds that can be shaped at the point of creation. 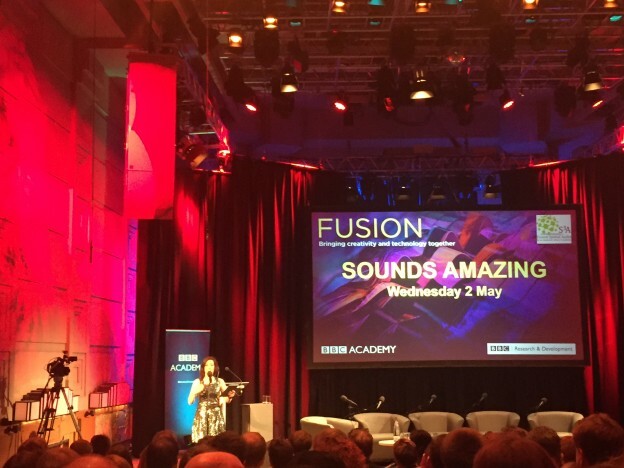 Sounds Amazing was brought by the BBC Academy Fusion project, BBC R&D and the S3A partnership. This event builds on the successful ‘Sound: Now and Next 2015’ conference from BBC R&D. It consisted of a day of talks, panels and a tech. expo. that was aimed to inspire and inform those from production and engineering about the latest developments in the amazing world of audio. Morning: Award Winning Audio Production, Commissioning and Top Tech Tips. Matthew Postgate, BBC Chief Technology and Product Officer, leading the BBC’s Design & Engineering division will open the event. L.J. Rich – Technology presenter (BBC Click), sound designer, inventor and NASA Datanaut will be the host for the day. Sounds Dramatic explores how great audio can add drama to your content whether fact or fiction, Radio, TV or emerging VR. Presentations include multi-award winning podcast producer, James Robinson on the heart-stopping drama ‘Tracks’ and the outstanding sound team of Kate Hopkins and Graham Wilde who were behind ‘Blue Planet II’ and ‘Planet Earth II’ for BBC 1 ’. A Sound Commission looks at what ticks the Commissioners’ boxes as Ben Chapman – Head of Digital, BBC Radio & Music; Mohit Bakaya – Commissioning Editor, Factual, Radio 4 and Zillah Watson – Commissioning Editor, Virtual Reality, BBC VR Hub share their favourite projects and preferences. Tips On Top Tech! Ali Shah – Head of Emerging Technology & Strategic Direction at BBC and Chris Pike – Lead Audio R&D Engineer at BBC provide a rapid fire guide to the latest technology to help you save money and sound great! 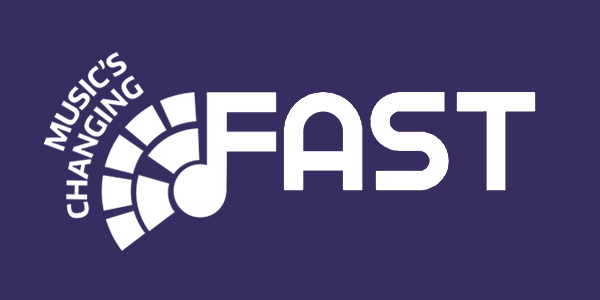 An opportunity to immerse yourself in futuristic sound experiences, connect with cutting edge technology experts from universities and industry – and explore exciting new partnerships. Lunch included for ticket holders, held in Media Café. Afternoon: Live, Immersive and Interactive – Innovative Live Performance and Immersive Production Techniques. Kicking the Mic! – Fusing live tap dance, looping and fully sound reactive LED dress – a short multi-sensory show by groundbreaking artist Laura Kriefman. Sound Bites – Immersive Masterclass – Catherine Robinson – Audio Supervisor, BBC explores the differences between 3D, binaural and surround sound and talks about her top production tips, setting up her own Binaural Studio in Wales and the developments happening there in radio, digital, live and VR. Mobile Technology Specialist at BBC Cymru Wales for a session exploring innovation in live recording. Sounds Academic – Professor Trevor Cox – Professor of Acoustic Engineering, University of Salford presents his experiment into object based audio by sharing a radio drama in a novel way, using mobile phones. Sound Bites – Breaking The Sound Barrier! Composer and Producer Matthew Herbert – BBC Radiophonic Workshop provides us with a glimpse into the razor sharp cutting edge of audio technology and his experience of breaking new territory. Talk To me – Interactive Sound – Mukul Devichand – Editor, Voice at BBC introduces the world of interactive sound and its potential for broadcasters. Henry Cooke – Senior Producer / Creative Technologist in BBC R&D gives us the producer’s view of ‘The Inspection Chamber’ an original interactive audio drama. Mark Savage – Music Reporter, BBC, describes his experience of living for a month with an Apple HomePod, Amazon Echo, Google Home…. putting 7 speakers to the test and talking to himself.